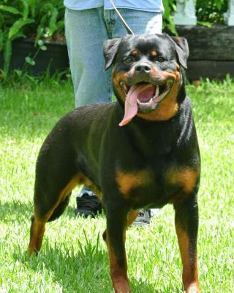 Our Rottweiler female, Peppy delle Abbadasse is a import from the world famous Italian kennel "delle Abaddesse". Although from Italy, Peppy has a full ADRK German pedigree. Peppy earned her 2012 SLRK youth Siegerin title at her very first show coming over to the United States. Peppy is a medium to large female with dark eyes and mouth pigment. Peppy has a beautiful block head but with a feminine attrubute. 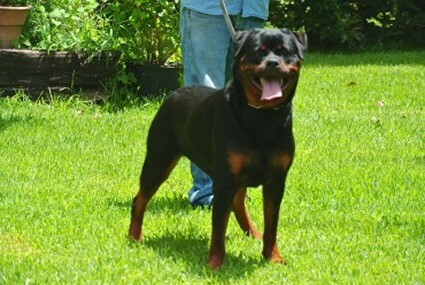 The sire to Peppy is another world famous Rottweiler stud male named Lenz von den Hassberghohen. Lenz was the 2010 ADRK Auslandsieger, multiple V1 Rated, and achieved his AD, BH, Schutzhund III. Another very hard achievement Lenz possesses is the Korung. 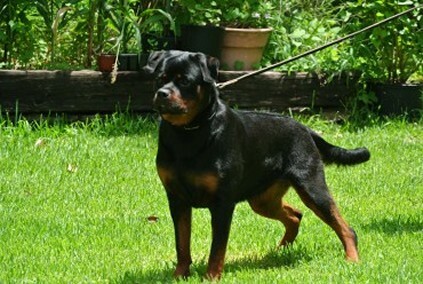 Peppy's mother Hanny von der Toneberger Hohe is a strong producing Rottweiler female. She has produced very structurally correct Rottweiler dogs with excellent temperments. We want to thank Nicola Cuomo from the "delle Abbadesse" Kennel for sending us Peppy, a exceptional female Rottweiler.